Whilst I’m super excited to be living with a new group of people next year in our new uni house, I’m missing Oadby so so much. 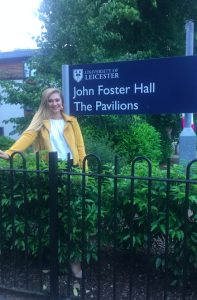 I was in John Foster Pavillions and I could not have asked for better accommodation… If I didn’t have to I wouldn’t have ever left! 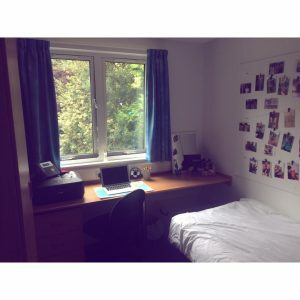 You might be thinking ‘how can you love uni halls that much? Aren’t they all basically hovels?’ Well if you’ve been to Oadby Student Village on an open day you’ll understand just how much this is NOT true. Oadby itself is truly beautiful, thanks to the undeniable leafy green aesthetic it gives off. There’s a small high street with a Wetherspoons, Iceland, Costa, M&S and a couple of other little shops alongside ASDA that are within a 10/15 minute walk of the student village itself. Oadby is also home to the university’s botanical gardens which again are absolutely stunning, and allow you to feel closer to nature whilst still being in the city. On warm sunny days a picnic is ideal but also this year we enjoyed the gardens in the snow too! The Botanical gardens really put the cherry on top for Oadby as a whole. Oadby Student Village itself also has a lot to offer, from music rooms and study areas to BBQs and frisbee. The village hub is something I didn’t really use that much in first semester but grew to love in second thanks to the pub quizzes every Sunday night. They even hosted a big bank holiday celebration with music, free food and inflatables and MORE! I can’t believe we won’t be able to quickly nip for hub food when we can’t be bothered to cook next year! 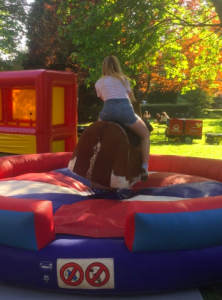 Here’s a picture of me on the rodeo bull approximately 0.2 seconds before falling off face first hahahaha. The residential team in Oadby Student Village were also amazing. The people in reception were always helpful and happy to accept my millions of parcels that I ordered (oops). Maintenance were on the ball too, we had an issue with our fridge and it was sorted within an hour of putting in a report! The best part of the team though has to be the Residential Advisors who run all the events in Oadby but also pop in once a month to check everything is okay, let you know what events are going on AND BRING CHOCOLATE! They gave me a boost even when I didn’t know I needed it. I loved my little flat in Pavillions and will honestly never forget the memories I made there in my first year. Everyone became my home away from home family and it was like one big community I feel no other university would have offered me. From the moment I moved in on the 23rd September I knew I wasn’t ever going to want to leave and boy was I right. If you’re interested in coming to Leicester, make sure to visit Oadby on one of our open days or visit days or you can check it out online with 360″ tours of the rooms! If you’ve stayed in Oadby Student Village or visited on an open day let me know what your favourite thing was! Hey guys, I’m Bryony but most people call me Bry. I’m a second year BA Human Geography student. In my spare time I love to travel, as well as watching movies and cooking for my flatmates. I’ll be writing blogs about a whole range of topics, including tips and tricks for uni life, my experiences of doing a geography degree, and everything in between. Bry, you didn’t mention the excellent sporting facilities just over the road, swimming pool, gym, track and pitches, tennis courts etc. But you’re right, it’s a lovely area which is why my wife and I have lived here for many, many years. So glad you liked it! Thank you for reminding me of the gym, unfortunately I didn’t use it last year, which is something I really regret now I’ve been told how amazing the facilities are! I will seriously miss this place, I think me and my flat mates will definitely be visiting the botanical gardens now and again for a bit of nostalgia! I wish you success in your new home.